Charley is mentioned in the Domesday Book as Cernelega and was said to contain four ploughlands belonging to Hugh Lupus, the Earl of Chester, who was a nephew of William the Conqueror. Later, Potter described it as "a large tract of land, about ten miles in length and six in breadth; in form somewhat square, and a hard and barren soil, full of hills, woods, rocks of stone, torres and dells of slate." 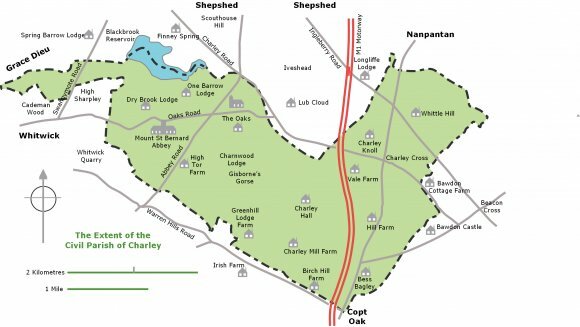 The Act of Enclosure for Charnwood Forest of 1808 did not take effect in Charley until 1829 because of the difficulty in apportioning the land and "The Wastes of Charley" as it was known, was an extra-parochial area outside the jurisdiction of any ecclesiastical parish and, therefore, paying no church or poor law rates. All extra-parochial areas were incorporated into Civil Parishes in 1894 and the first Parish Meeting of Charley Parish was held in December 1894 with the Rev. John Martin of Charley Hall being elected Chairman. There were several boundary changes over the years and Charley Parish now consists of 1323.258 hectares (3269.8 acres) and has seventy five dwellings with 172 electors making it one of the smallest parishes in Leicestershire. Of the 172 electors, some thiry plus are Cistercian monks of Mount St Bernard Abbey. Charley is internationally known for its "Bomb Rocks" on the Leicestershire and Rutland Wildlife Trust land, a Site of Special Scientific Interest. 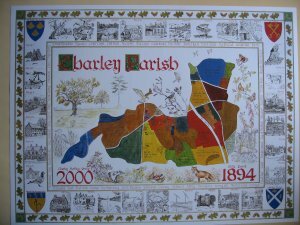 Charley Heritage Group was formed in 2000 to mark the Millennium and to begin the task of recording the history of Charley Parish. Their first venture was to make a pictorial map of the Parish and residents worked together to make the five foot by four foot map which is on display in the guest lounge of Mount St Bernard Abbey. A full size copy is in the Oaks Storer Hall. 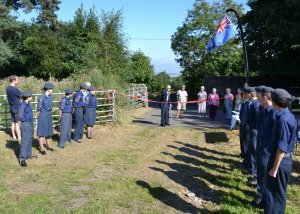 The Group has been successful in obtaining several grants to further their work and, under the national scheme, hosted Heritage Open Days at the site of the top secret World War Two RAF Signals site, known as the Beambender, in St Joseph's Field. 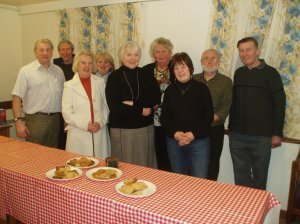 Meetings are held monthly in members' homes and new members are always welcome. Contact Maureen Havers on 01530 811149 for further information. RAF Cadets form a guard of honour for Mr Ken Nicholls at the opening of National Heritage Day 2013 at Charley's WW2 RAF 80 Wing (Signals) site.